Maroon Tigers were the final team to lose in Division II. Nothing lasts forever, including the unbeaten streak of Morehouse. 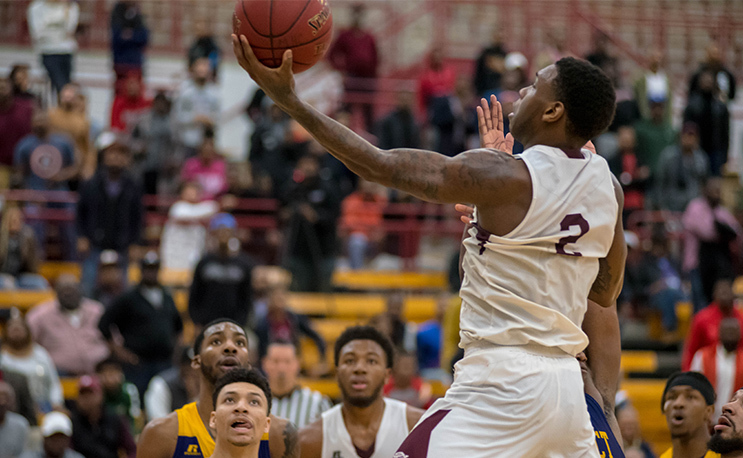 After starting the season with a school record 18 straight wins, the Maroon Tigers fell flat on Wednesday night at Claflin, losing 85-72. Morehouse was the final men’s team in Division II basketball (and Division I) to lose a game this season. The Panthers avenged a heavy-handed loss to Morehouse earlier this month by delivering one of its own. It was a back and forth game for the first 12 minutes of the game before Claflin started creating some distance. The Panthers went on a 9-0 run at the 8:29 mark of the first half to go up 37-26 with 5:15 to go before the half. The Panthers were up 46-38 at the break. Claflin outscored Morehouse 5-0 in the first two minutes of the second half to push the lead up to 51-38. Morehouse cut the lead as close as seven points briefly but Wednesday night belonged to Claflin. The Panthers didn’t drill Morehouse with a bunch of three-pointers. Instead, it was a steady dose of 6’9″ Jaleel Charles down low. Charles finished with 23 points and 11 rebounds on 11-13 shooting. Claflin only made five three-pointers all game long. Tyrius Walker had 27 points for the Maroon Tigers but his three-point shot was off. Walker was 1-8 from behind the line. Walker came into the game shooting 44 percent from the three-point line. Things don’t get any easier for Morehouse as another revenge match looms on the horizon. Morehouse plays Benedict College on Monday, the team they narrowly escaped in overtime last week in Atlanta. After that, it’s the much-anticipated matchup against Clark Atlanta on February 8. The win by Claflin snaps a four-game losing streak that began with the loss at Morehouse. Claflin began the season with an incredible 17-1 start before coming back to earth. Claflin will get a chance to exact revenge on a visiting Clark Atlanta team this Monday. CAU gave Claflin a thorough 97-82 drubbing two days after the Morehouse loss. After that, the Panthers will play back to back games against their arch rival Benedict.